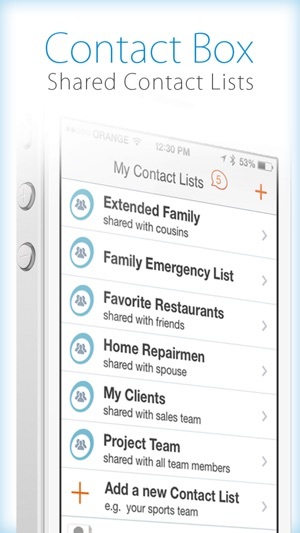 Instantly share entire contact lists with others who need them too! ContactBox is a simple contact lists sharing app that lets you create and share entire contact lists with anyone you want in just one simple click. ContactBox has many uses at home, at work, with friends and with family! ** The Ultimate Office Productivity Tool! Use ContactBox to share a Client list at work with colleagues - reach whoever you need, whenever you need them. 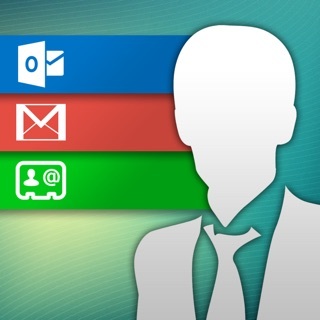 With ContactBox just one colleague needs to add a new client and everyone instantly has their information. ContactBox is great for small businesses and large enterprises! It can be a great office tool or project management solution! ** A Great Free Family Planning Tool! ContactBox can help you ensure you have all the people you need at your fingertips. Use ContactBox to Create a sharable family emergency list and include important emergency contacts such as family pediatrician, local medical facilities and more. ** A Family Contact Management Solution! With ContactBox you can communicate and connect with family members no matter how near or far. 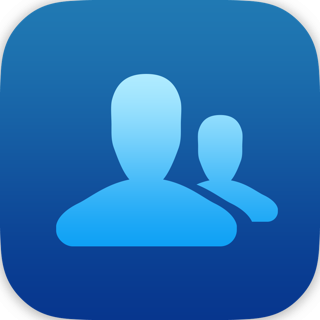 Create a family address book on ContactBox and instantly organize your family contacts and share numbers with anyone. ** Managing Contact and Mutual Friends just got Easier! Planning a picnic with your mutual friends? Want to plan a couple’s vacation and connect with your spouses friends? Use ContactBox to create a sharable Mutual Friends phonebook and never have to ask for a number again. ** Need Home Services or Repairman? 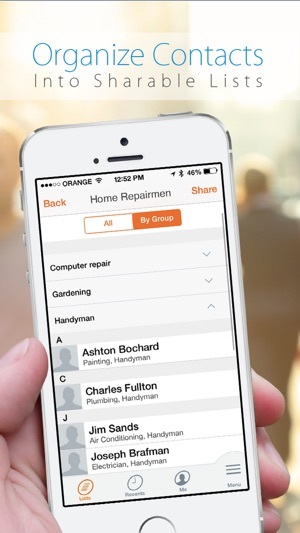 ContactBox lets your create home repairman lists to share with family and friends! Next time you need a roofer, electrician, painter or air conditioning specialist, you will know who to call! Contact Box is great for friends that want to share a single addressbook, couples that wish they could have one phonebook on shared phones teams that want to have digital contact lists that are secure, sport teams that want to have a continuously maintained updated roster, offices that want all employees to have access to clients and colleagues no matter where they are, or anyone that wants to share contact lists in a fun and easy way! With ContactBox you can easily sort your contacts into sharable digital contact lists and share those lists with anyone you want! 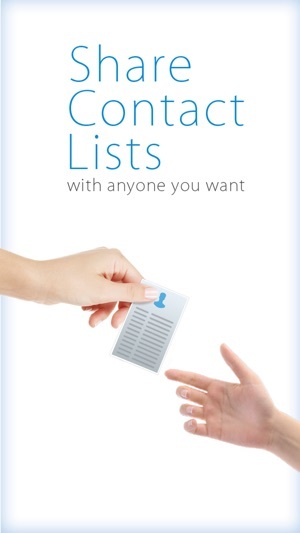 Don’t just share contacts – share entire contact lists! Contact Box is the only productivity application that combines contact management, contact list sharing, addressbook collaboration and secures your contact information. With ContactBox – the contact list sharing application – you can enjoy real time contact management updates from anyone. Any contact list member can update the entire shared address book, and any update is immediately seen by all shared contact list members. That means that any time you or one of your contacts changes their information, anyone who collaborates on the shared contact list will be able to instantly see the update! Talk about contact list management and phonebook collaboration! Contact Box is a great way to manage contacts and organize your address book! 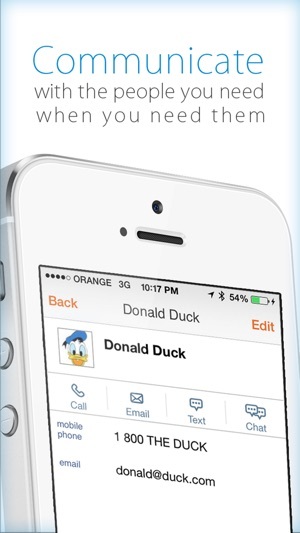 With Contact Box you can securely backup and sync contacts, share with friends contact lists! ContactBox can serve as your virtual phonebook with secure cloud backup and a simple ability to share your address book and backup contacts in seconds! Contact box contact sharing is a fun and free app you can use anywhere – anytime! ContactBox is the ultimate productivity tool for small businesses and can be a great education tool for parents, teachers, and entire schools. Sports teams looking for sports management solutions can rely on ContactBox to share entire lists. If you guys could make a way to download the contacts back onto your phone, or airdrop them all to my phone, I would be eternally grateful and also I will donate $100. I really want these contacts to be in my contact list on my phone as well as the app, but for some reason I can’t make this happen. Before you can even see the app it requires you to give them your phone number and email. This is not necessary and is just their attempt to gather data. Go use another service. I am willing to pay for no ads. They are super annoying.